Be inspired and get motivated to create with these idea stenciling projects! So, you like designing and creating art with stencils but you need more Stenciling Ideas ! Great, because below you’ll find some unique prospects for creating in ways that maybe you haven’t considered yet. I love trying new things, don’t you? Just click on the blue text or any image for all the details! Transform a plain wall into a garden of designs, patterns, colors and maybe even a whole scene simply by securing a stencil to the wall and painting over it to create Stencil Wall Murals. Whatever mood you are trying to create, there is a stencil out there to inspire you! 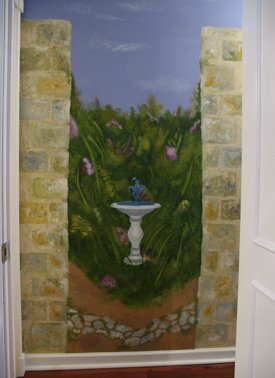 Using Wall Stencils is a great alternative for creating hand painted images on your walls if you don’t quite trust your painting abilities to actually free hand designs on a wall. 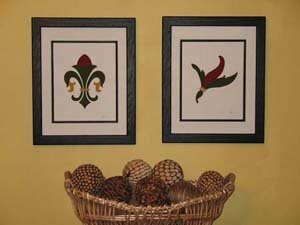 Even if you have some skills with a brush, decorating with stencils help you paint images that are always consistent. Yet even total novices can have a blast with a few small jars of paint and a pack of stencils, letting their imagination run wild with their stencil as their guide. When we think of Stencil Art, we often picture an image painted on the wall. But have you ever considered using stencils to create art prints to hang on the wall? Well, it’s a great way to decorate. You can use unique designs to match the theme of any room and choose colors in the print to match any decor. Your framed artwork can be totally customized to fit your space! If you’ve ever had trouble finding just the right art piece to hang over the couch or behind the bed you know what I mean. With stencils you can make your own art, match your setting perfectly and have an absolute blast doing it! Not to mention how jealous your guests will be with your one of a kind art. OK! We covered stenciling on walls and idea stenciling for art to hang on walls, but what about stencils to hang on us? I mean our clothing. Have you ever thought about designing our own wardrobe? 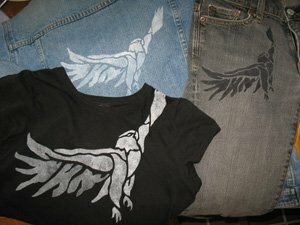 Well, here’s an Eagle Stencil for you to transform an old pair of jeans into a new cherished part of your wardrobe. Of course you can go hog wild like I did and paint him on a T-Shirt or an old Jean Jacket. If you like the idea of giving your clothes a make over than you'll want to watch the video on this page where you can see this done in action! Preparing for a new arrival or making a gift for a new mother? 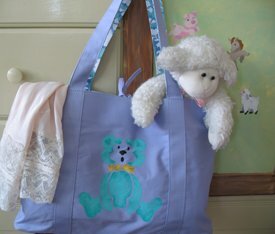 See a cute Teddy Bear Stencil and how it was painted on a tote bag for Mom to carry all the babies stuff. And best of all, the stencil is free! Again, this idea stenciling page will get you thinking about gift making. I love to make gifts for friends and family because I know they will be getting a unique gift. Plus I am offering to them a piece of my heart in the artwork that I created for them. Not to mention the money I save and time I save from dragging myself through the mall looking for just the right thing! Do you have an old piece of furniture that you are ready to drag to the curb on trash day? Wait! Read this Furniture Painting idea stenciling project before you throw anything out and learn how you can create a beautiful piece that is custom designed for any unique space. There's nothing like the sound of the waves and the rush of the sea air to wash away all our worries. It's no wonder that a underwater theme is so popular. 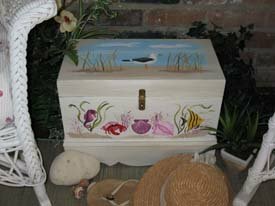 Join me as I invite a little of the beach into my home by repainting a small chest with these Sea Stencils. 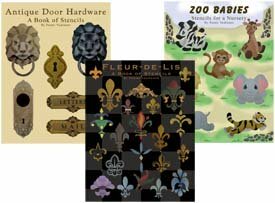 There you'll find these designs in a unique book of stencils. Also, if it's creature that you're into, don't miss the animal stencils. The holidays are the best time for artist and crafters like us. It’s really just another good reason to create. There are gifts to be made and decorations to make. Busy people like us need some help and stencils are always to the rescue. 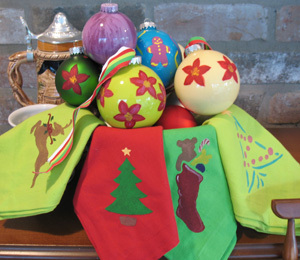 Well, here at All About Stencils we offer many Homemade Christmas Crafts idea stenciling. Well, this one is a great way to dress up your holiday table, dress up a gift or accent a special decoration. In fact, that’s just one of the many projects from the Christmas Crafts Collection. 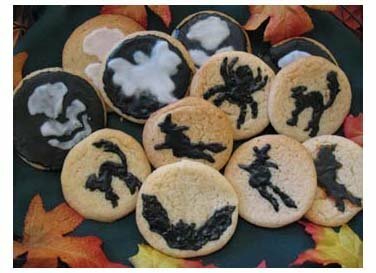 Ready for some tasty treats made with scary Halloween Cookie Stencils? Well, I tested many ways to do just that and now I present to you the best, easiest and least expensive way to make Halloween cookies with stencils. To get there click on the blue text or on the cookie picture. Hey! Don’t forget that I (and everyone else) want to see what you have done with your idea stenciling. Just click on Stenciling Projects to get your masterpiece showcased here on this web site. Won’t that be exciting! Or if you have any questions or want to share information join in on the Stencil Blog. Well, I hope to hear from you soon. Return to Home Page from Idea Stenciling. Return to Stenciling Ideas from Idea Stenciling.